Anyone who has been a long time reader of this blog (if there is even anyone!) will know that I am somewhat enamoured with Zelda Fitzgerald. In the popular imagination, she is the slightly unhinged figure always standing by the side of Gatsby creator F. Scott Fitzgerald and together they are a well dressed and extravagant couple who drink and smoke and dance all in the name of a good time. Their love story is a somewhat tragic one, but as Fowler says in the acknowledgements of this book, it is a matter of contention who derailed whose life. Was Zelda truly the crazy, needy, jealous, clingy lesser half of the famous couple? Or was Scott to blame? Z: A Novel of Zelda Fitzgerald sets out not to answer this question definitively, but to give Zelda a chance to tell her side of the story. Growing up a young woman in the 1920s, Zelda was ahead of her time. She was feisty, flirtatious and headstrong, and never meant to be anyone's little wifey. When she met Scott Fitzgerald in 1918, she thought she had found her equal. They loved each other passionately. For the first few years of their lives in this book, Scott encourages Zelda to grow her personality. He wants her to become part of his literary image and so he asks her to act like the flappers in his book. Life begins to look more than a little like art, and soon Zelda truly is the First Flapper. She cultivates her own talents too- painting, writing, dance- hobbies to which she believes herself entitled because she is willing to drop everything and follow Scott wherever his intuition takes him. They live in New York, in Rome and in Paris. It is in Paris where Scott meets Hemingway. Readers of last year's The Paris Wife by Paula McLain will feel that Scott was the lesser half of the Hemingway-Fitzgerald duo. He was painted as the hopeless hanger on with the nutty wife. He worshipped Hemingway and did as he was told. Fowler presents this same relationship from a slightly more converse angle. Scott believes that he is the cultivator of Hemingway's talent, and dangerously feeds his so called protege's ego and his own. He tries to live vicariously through Hemingway and compensate for his own lack of productiveness by claiming some part in Hemingway's. To Zelda, Hemingway is a menacing figure, the embodiment of ego, vice and infidelity, sexually threatening to women and emotionally threatening to Scott. Zelda despairs that Scott cannot see the negative implications of his nights with Hemingway- the drinking, the gambling, the money lending. Some readers may be put off by the style of the writing in this book. Fowler seems to break the cardinal rule of 'show don't tell' which can make some sections cumbersome to get through. At first, this bugged me so much that I nearly stopped reading! Then I realised that the novel is designed to be read as if we were privy to Zelda's diary or her written recollections. This may have been a somewhat unwise choice, such as in sections where an exciting scene is reduced to a mere sentence. Z is similar to How to Be A Good Wife (2013) in that it shows us an utterly convincing version of events, makes us feel some sympathy for the heroine and then whips the tablecloth away. 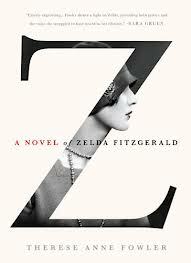 Perhaps owing to the fact that we are already expected to have some knowledge of the Fitzgerald's, or perhaps because this is a novel which is more concretely grounded in an imaginable place and historical context, Z leaves us wondering who to believe at the same time as imbuing us with a new respect for Zelda. The Paris Wife this book is not, but it was still a thoroughly enjoyable read.